I’ve been hearing a lot about sensory bags lately. I searched for them on Pinterest and every post seems to be 50+ sensory bags. It’s all a bit overwhelming. I’m thinking…all I need is a simple post telling me how to make one of these things. 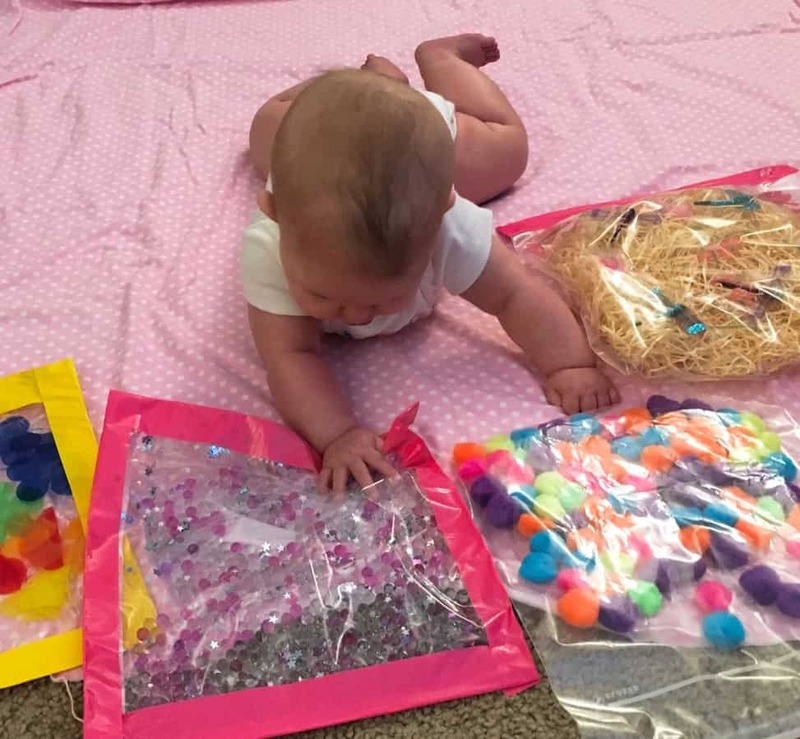 Sensory bags are easy to make and provide fun and low-cost entertainment for my 6-month-old. If you have an older child check out sensory bins like this Easter themed sensory bin. 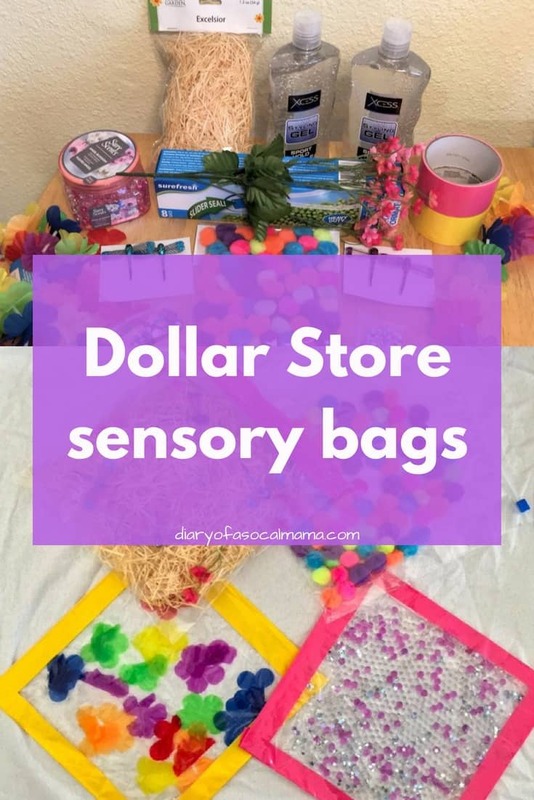 To make a sensory bag you simply add items to a ziploc bag, suspend in hair gel or oil if you like, and seal them up with some duct tape to ensure nothing comes leaking out onto little hands. I started with a trip to the dollar store. 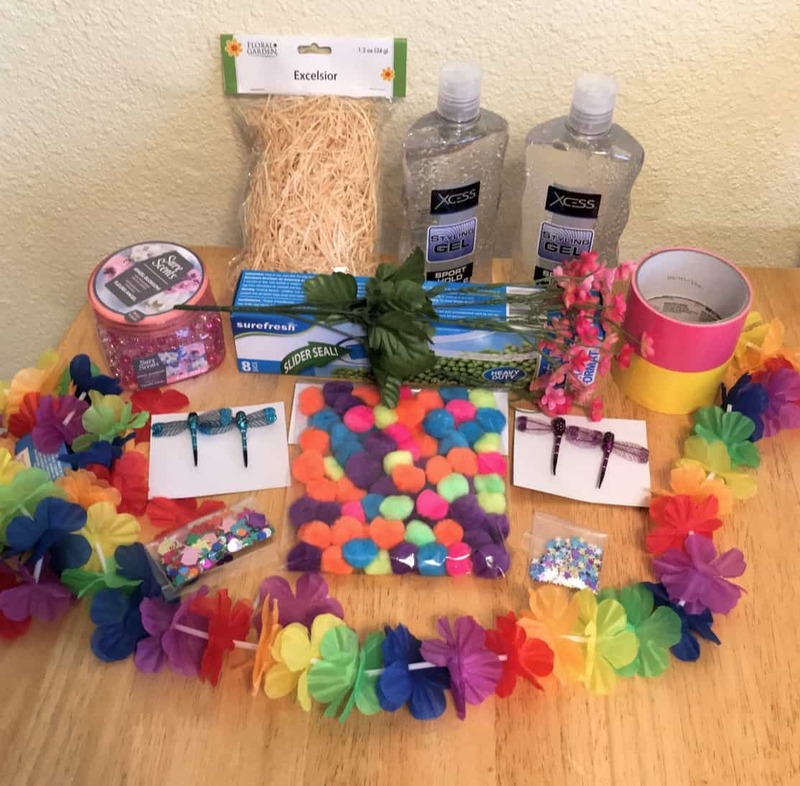 I was able to pick up all these items, everything I need to make the sensory bags for about $10. The essentials are some freezer size Ziploc bags, duct tape, and some hair gel. Then you can pick up whatever random assortment of items you think will be fun or use leftover arts and crafts items from around the house. I actually had the glittery stuff in my desk. Fill the bags with an assortment of items and then tape them all the way around with the duct tape to give them a really good seal. I made these four. I only used the hair gel in one bag. Now you’re ready to play. They can use them on their high chair, while sitting in your lap, or for something to look at during tummy time. I think they were a hit! Her favorites are the glittery pink one and the one with the confetti type stuff because it makes a rustling sound. (I actually found this stuff on the floral aisle). Great cheap entertainment and completely customizable. 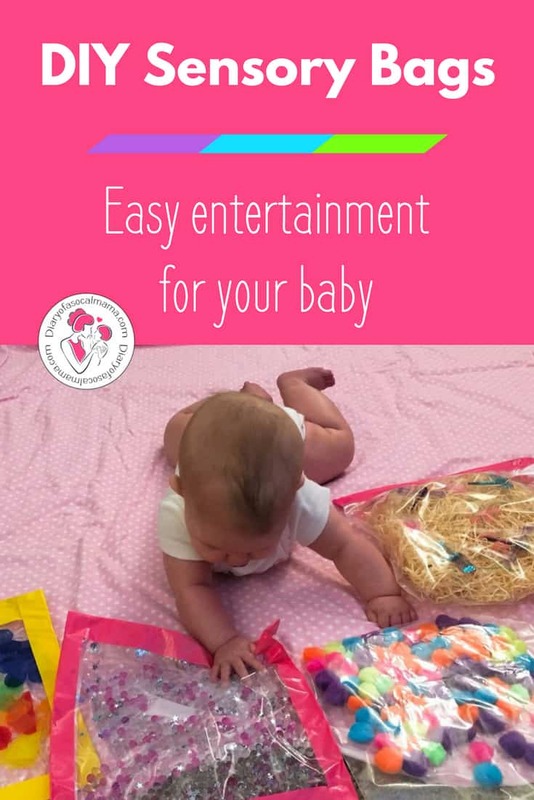 Try a few out and see what your little one likes. Make sure you get ziploc bags that you push sealed, not the zipper kind. The zippers keep you from getting a tight seal and I think one of mine leaked due to this. Double bagging them can help ensure a good seal and add a little extra thickness to prevent little fingernails from puncturing the bag. I only needed about half of a large bottle of hair gel for the bag I made so only buy as much as you think you’ll need. Include your baby in the creation process. My daughter had a great time watching me make the bags. 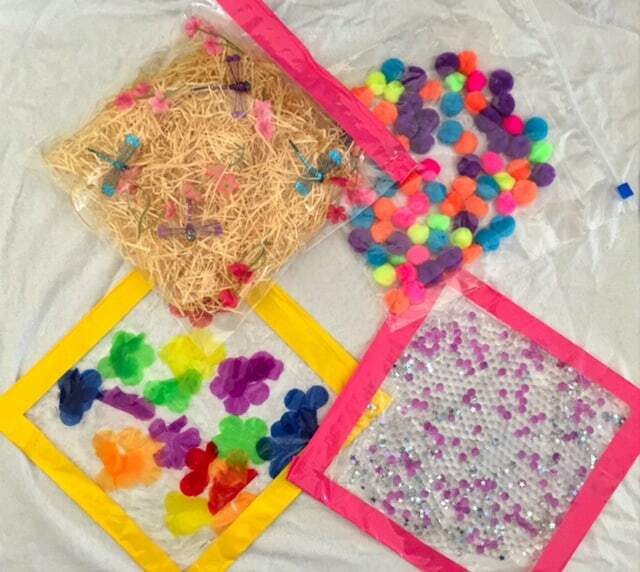 They’re sensory bags so try a variety of sounds, colors, textures for them to explore. Don’t want to run to the store? You can get Craft Supplies delivered to your door in 2 days by Amazon. Share your creations in the comments. I’d love to see what you make! For more fun check out this edible finger paint recipe!